1. “Fred Webb Recollections,” May, 1999, Fred Lee Webb. 3. “Richard Webb's First Baby Book,” Fred and Arlene Webb. 4. Lynn Oscar Webb, LOW-001. 5. “Social Security Death Index,” https://www.stevemorse.org/ssdi/ssdi.html?engine=ssdm.php, https://aad.archives.gov/aad/fielded-search.jsp?dt...mp;cat=all&bc=sl. 6. “Family Recollections of Fred L. Webb,” March 27, 1999, Richard Webb, Modesto, California, FLW-001. 7. “California Death Index; 1940-1997,” California Department of Health Services, Vital Statistics Section, http://vitals.rootsweb.com/ca/death/search.cgi, https://familysearch.org/search/collection/2015582. 8. Lorna Webb Greenlee, LWG-001, 2/26/1999. 10. “California Birth Records,” 1905 - 1995, https://familysearch.org/search/collection/2001879, California Department of Health Services, Vital Statistics Section. 14. 1891 Voters List, 1891, TN. 15. Michael A Edwards and Carol L Markworth, “California, Marriage Index, 1960-1985,” April 27, 1973, Los Angeles, Los Angeles County, CA, https://familysearch.org/pal:/MM9.1.1/V6FW-PV1, https://familysearch.org/pal:/MM9.1.1/V6J7-3JZ. 18. “DeWees - DeWeese Family Home Page,” Ted DeWees, http://home.earthlink.net/~tdewees/. 21. David and Sally Appleby, “The Lee Family,” http://www.rootsweb.com/~tnsumner/lee.htm, 1998. 23. “Eaton Family History,” May 23, 1999, J P Eaton, http://www.members.home.com/jpeaton/. 24. Karen Neely Mullins, “Clendening Cemetery -- Excerpts,” http://www.rootsweb.com/~tnsumner/clencem.htm, April, 2000. 25. Nonie Webb, 5/7/1, NW-001 (William Webb and Jane Martin), NW-002 (John Webb and Sarah Cocke). 26. “United States Census,” 1820, TN, Robertson, Springfield, M33, 125, 39, Bureau of the Census, US Dept. of Commerce, United States of America. 27. C F Moore, “William Smith Webb,” July 7, 1999, CFM-002. 28. “United States Census,” 1830, TN, Sumner, Western, M19, 181, 216, 164, Bureau of the Census, US Dept. of Commerce, United States of America, Isaac C Douglas. 29. “The Clowers/Blackston Genealogy,” December 6, 1999, Arline Collins, http://pedigree.ancestry.com/zipfiles/33354.zip, http://www.dhc.net/~design/gedcom/collins.htm. 33. “St. Peter's Parish Register,” http://vagenweb.org/newkent/stpete_toc.html. Eliz. Daught to Jno Webb bapt ye 8th of Aprill, 1688. James son to Jno Webb nat 25 of June bapt ye 19 of Oct, 1690. Jane Daut of Jno Webb bapt the 11 June, 1697. John son of John Webb bapt the 20 April, 1694. Will son of John Webb bapt ye 17 Septmbr, 1699. Wentworth son of Jno Webb born the baptiz. the 31 May, 1702. Mary daut of John Webb baptiz. ye 19 Mah., 1703/4. Jno Webb & Mary Martin was married Febry. 12th, 1712. Samuel son of William and Jane Webb, born Feby. 6, baptized May 9. 34. “Christ Church Parish, Virginia Records, 1653-1812,” http://www.archive.org/details/parishregisterof00chri. 35. “Nonie Webb,” 10/28/2000, Richard Webb. 36. “15224,” May 4, 1999, http://pedigree.ancestry.com/zipfiles/15224.zip. 37. Judy Simpson, “Simpson Family History,” http://worldconnect.rootsweb.com/cgi-bin/igm.cgi?o...simpson&id=I0216, October 9, 2000. 38. “33354,” November 28, 1999, http://pedigree.ancestry.com/zipfiles/33354.zip. 39. 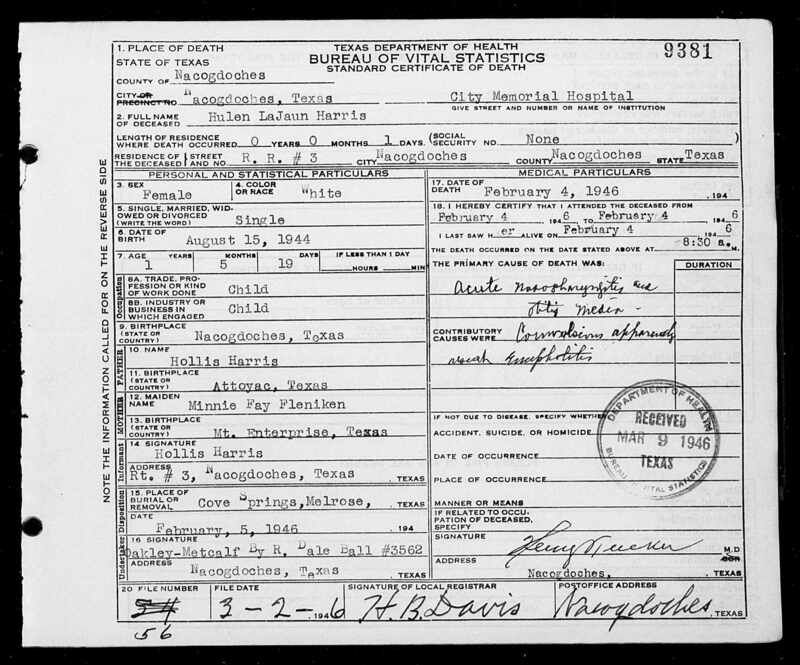 Hulen LaJaun Harris, “Texas, Deaths, 1890-1976,” February 4, 1946, City Memorial Hospital, Nacogdoches, Nacogdoches County, TX, USA, GS Film number: 2218231 , Digital Folder Number: 005145022 , Image Number: 03104, https://familysearch.org/ark:/61903/1:1:K39J-C4B. 40. Janet King, “Perdue and Associates,” http://awt.ancestry.com/cgi-bin/igm.cgi?op=GET&...mp;id=I00049&ti=,, http://www.rootsweb.com/~tnsumner/perduem.htm, http://www.rootsweb.com/~tnsumner/perdueas.htm, September 26, 2004. 41. Linda Carpenter, Danene Vincent & Diane Payne, “Scholastic Population, 1838, District 17, Sumner County, TN,” http://www.rootsweb.com/~tnsumner/scdist17.htm, June 18, 1838. 42. Aliene B. Herin, “Re: William Smith Webb,” September 14, 1999. 43. “Letter to Mrs. Winstead,” BCZ-001, Burney C Zarecor/Compiled by O. H. Herrington. 44. wdlatimer, “latimer family in america,” http://worldconnect.rootsweb.com/cgi-bin/igm.cgi?o...wdlatimer&id=I68, April 19, 2000. 45. Shari Pullon, “Descendants of Samuel C. Beard,” http://www.rootsweb.com/~tnsumner/beard3.htm. 46. Jordan R Dodd, “Tennessee Marriages, 1851-1900,” http://search.ancestry.com/cgi-bin/sse.dll?srvr=se...mp;submit=search&;gskw=&gsdr=0&prox=0&ti=0&prox=1&GS=WEBB+TELITHA. 47. Mary Johnson Link Hester, “The Diary of Mary Johnson Link Hester (part 4),” http://www.rootsweb.ancestry.com/~tnsumner/sumnhes3.htm, January 1917 - December 1918. 48. Ancestry.com, “Tennessee Marriages, 1851-1900,” http://search.ancestry.com/cgi-bin/sse.dll?db=tnma...rriages%2C+1851-1900&DatabaseName=tnmarr1851&SearchEngine=sse.dll&Server=search&Type=P. 50. “Mable Webb's Photo Album,” Fred and Mable Webb.